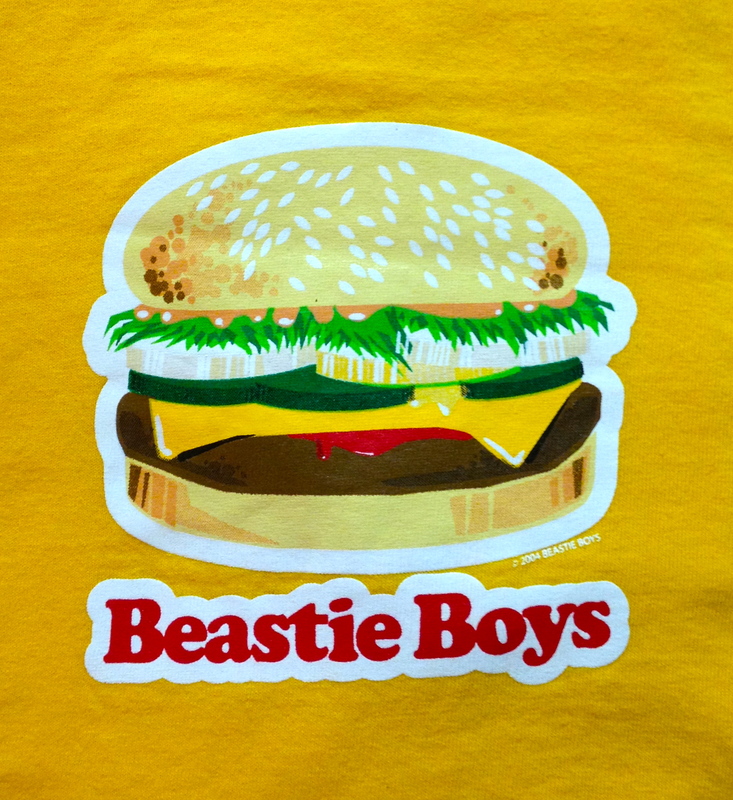 The last two years, we honored Beastie Boys’ Adam “MCA” Yauch’s August 5th birthday with memorable (and filling! 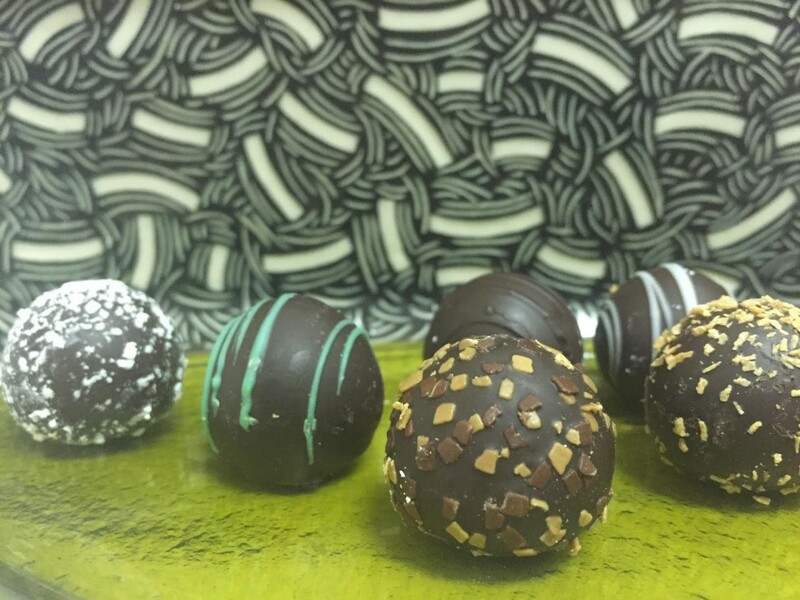 ), food and drink tours, which you can read about here (2015 & 2014). This year, a few of us again got together over a few days this past week to celebrate Yauch’s music and message over Beastie Boys-inspired food and drink — with many new stops — throughout Philadelphia and the Greater Delaware Valley, playing Beastie Boys on the jukebox wherever we dined and sipped, and we encourage all Beastie Boys fans (and bars/restaurants) everywhere to celebrate similarly today and every year on August 5th. 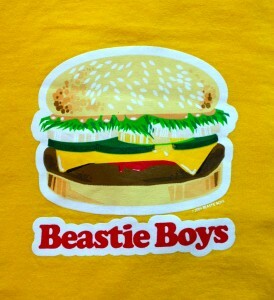 Thank you, Adam Yauch, for everything. 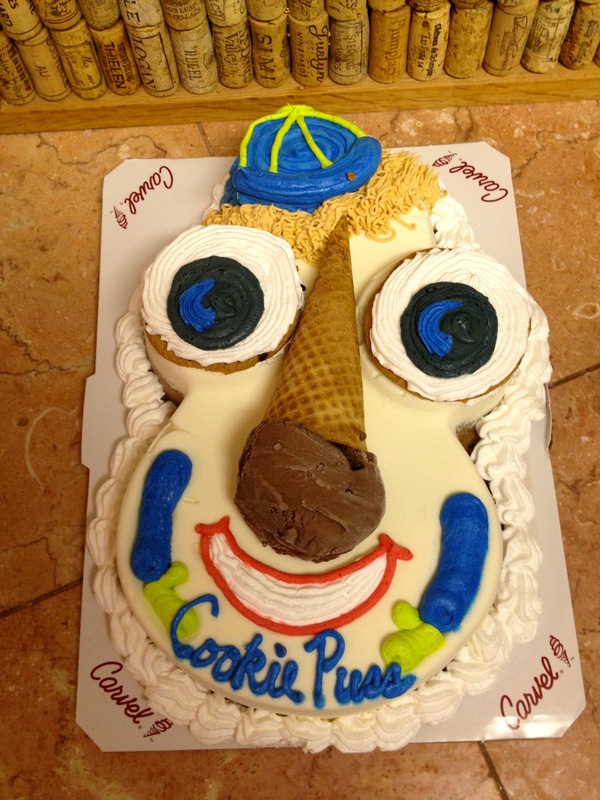 For the third year in a row, we eat and drink in your honor. Happy Birthday, MCA! 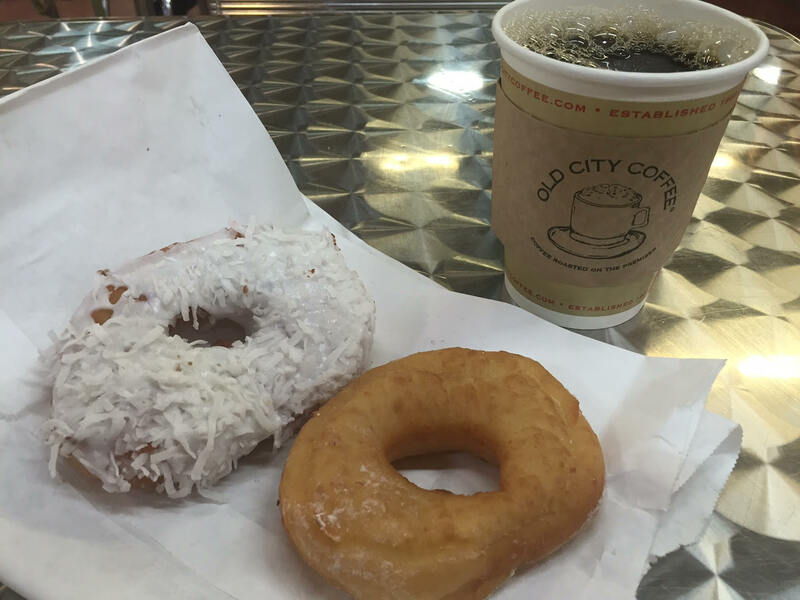 We started off our food tour with a cup of coffee from Old City Coffee and two donuts from Beiler’s Donuts in the Reading Terminal Market — instead of Dunkin’ Donuts. As we detailed our first year, many people think a Brass Monkey is a malt liquor bottle with some orange juice added after the first few sips of brew. Well, according to Mike D, their famous song is based on a premixed cocktail of rum, vodka and orange juice. We started our first afternoon off with Brass Monkey cocktails. 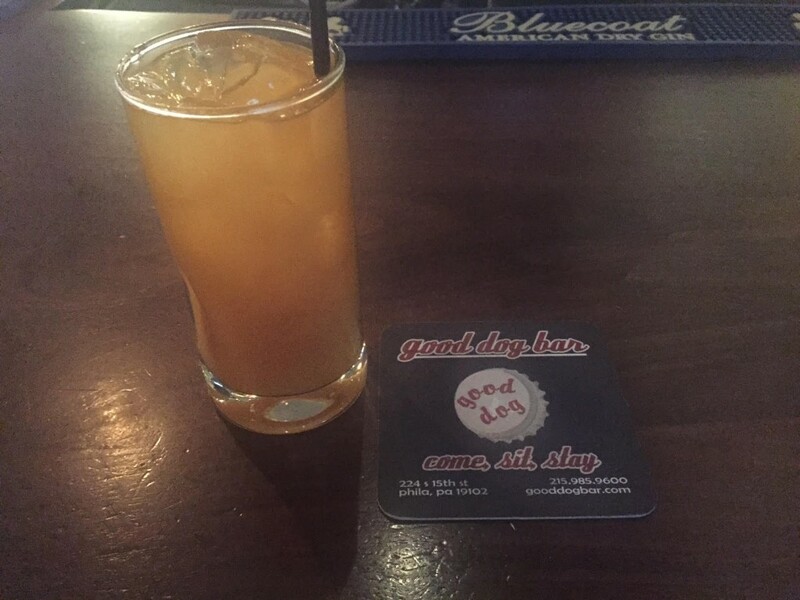 Bartender Richard at The Industry (Good Dog Bar‘s sister bar) expertly mixed up equal parts dark rum, vodka & orange juice over some rocks. The first year, we microwaved up some White Castle sliders. (Of note, there are no White Castles nearby Philly anymore.) 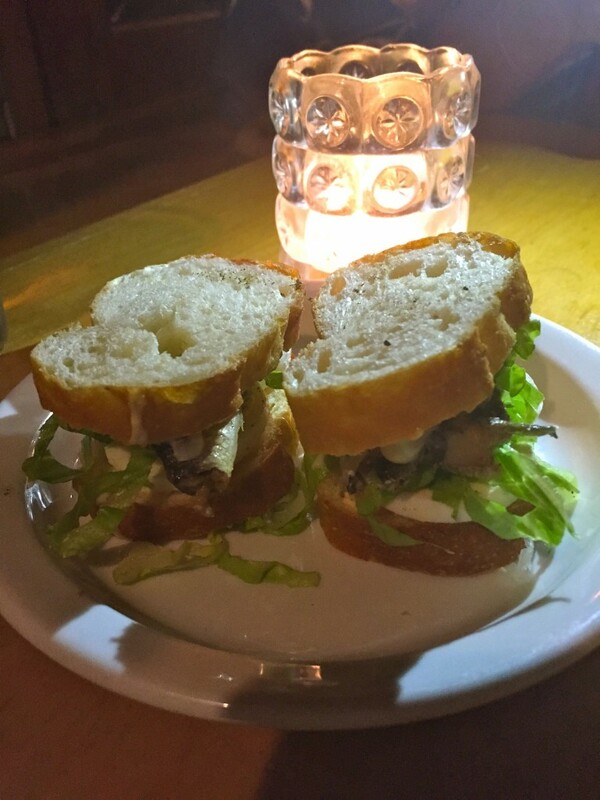 Last year, to mix it up, we enjoyed Varga Bar‘s outstanding Kobe beef sliders with onion rings. 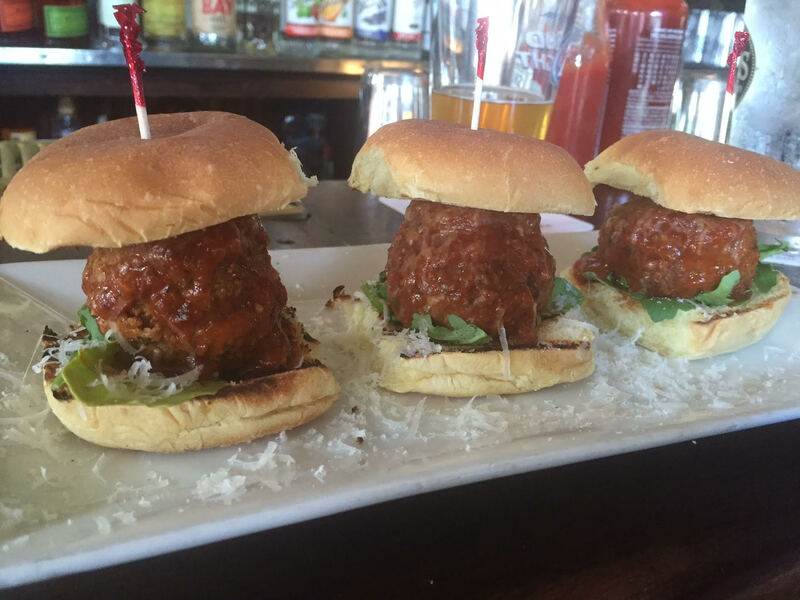 This year, we went a step further and chowed down on some awesome meatball sliders at London Grill. 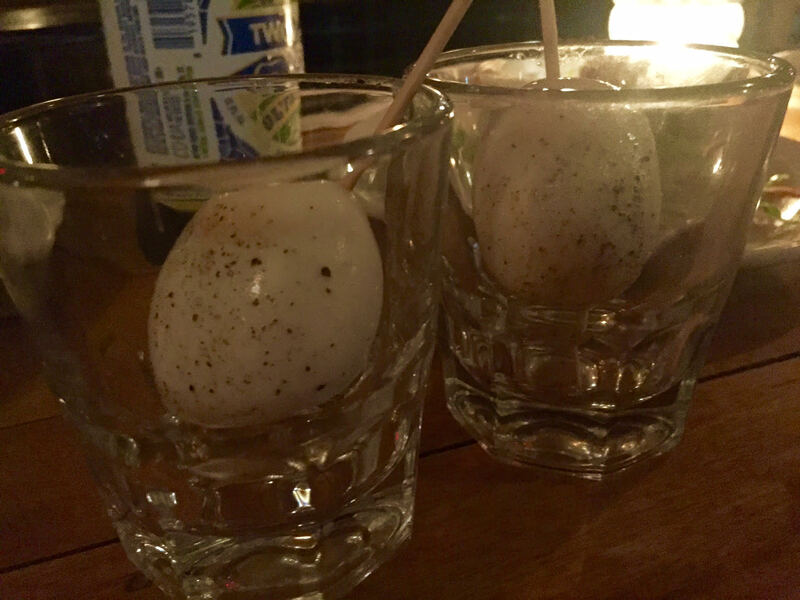 Luckily the fried chicken sandwich was on the menu at American Sardine Bar this year, so we paired that with a couple pickled eggs in honor of “Egg Man.” We elected to drink craft beer, once again, instead of Heinekens though. 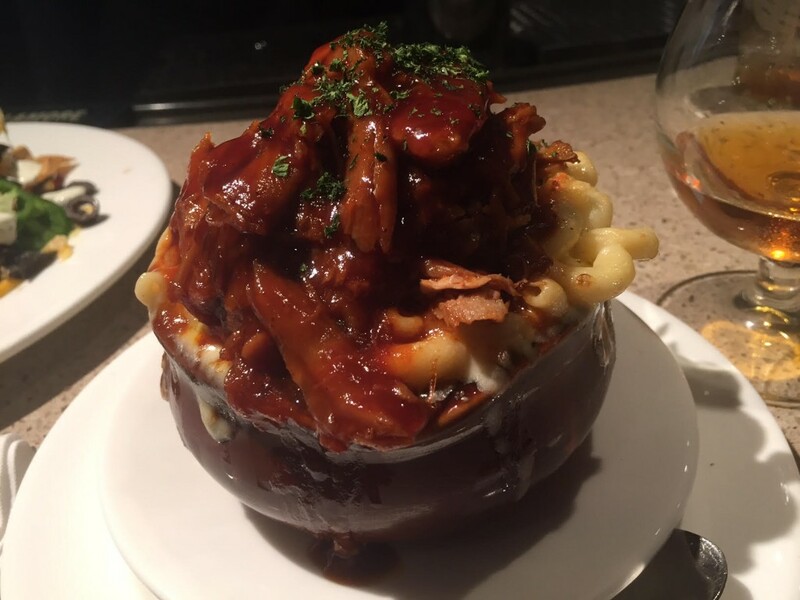 This year, we made our way to Glenmorgan Bar & Grill in the Radnor Hotel (Radnor, PA) and enjoyed their awesome BBQ pork mac & cheese in honor of Q-Tip (who guests on “Get It Together”). 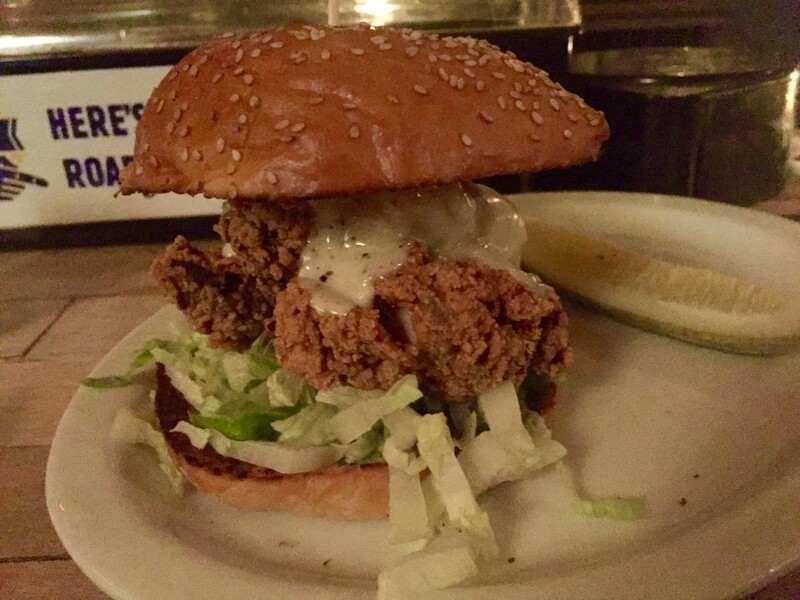 This year, we went to Taproom On 19th for their Tap Burger, made with LaFrieda Beef. We added some 1732 Meats Garlic Insanity Bacon, too. 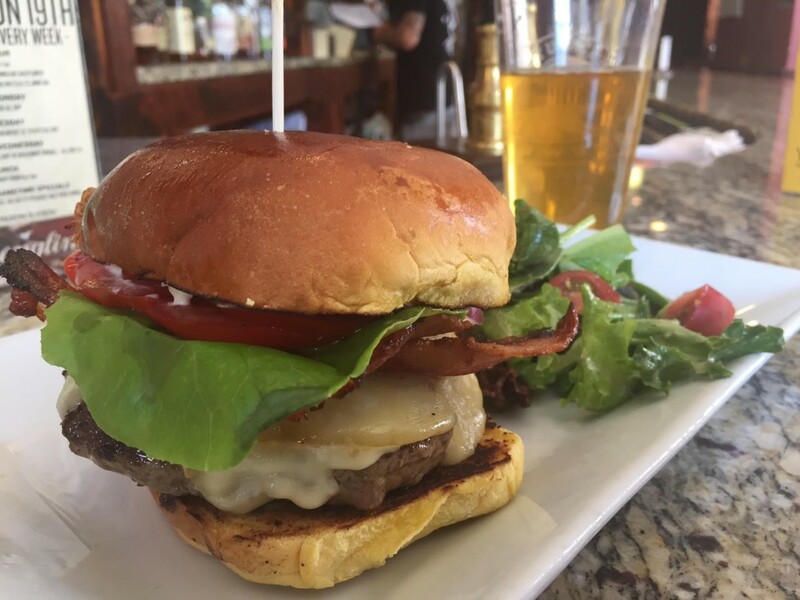 Awesome burger! 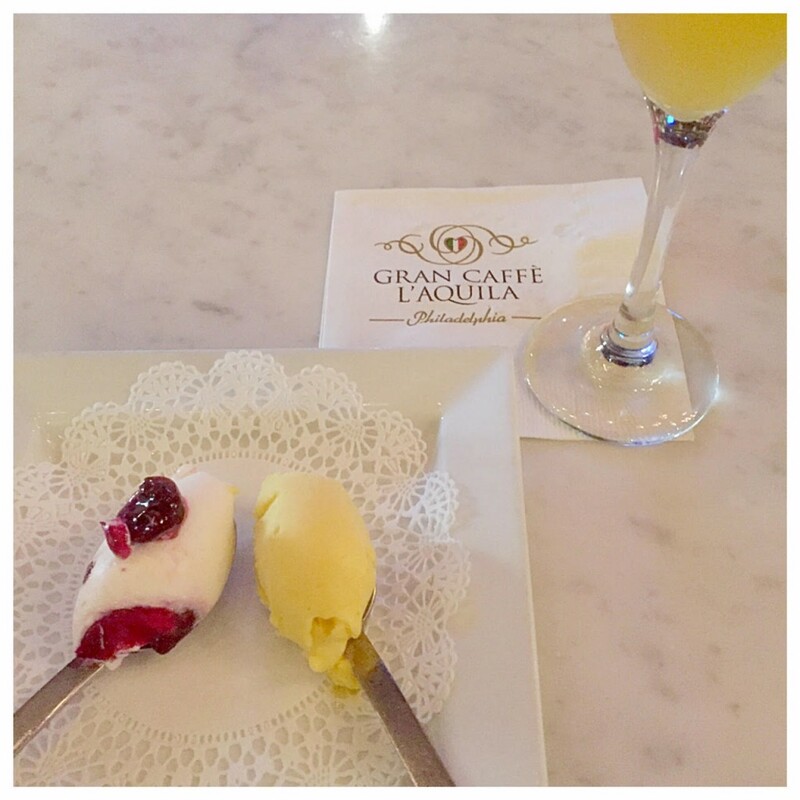 For the “cherry” and the “peach,” we went to Gran Caffe L’Aquila and ordered “desire” (cherry) and peach gelato (the best in the world!) with a peach bellini. 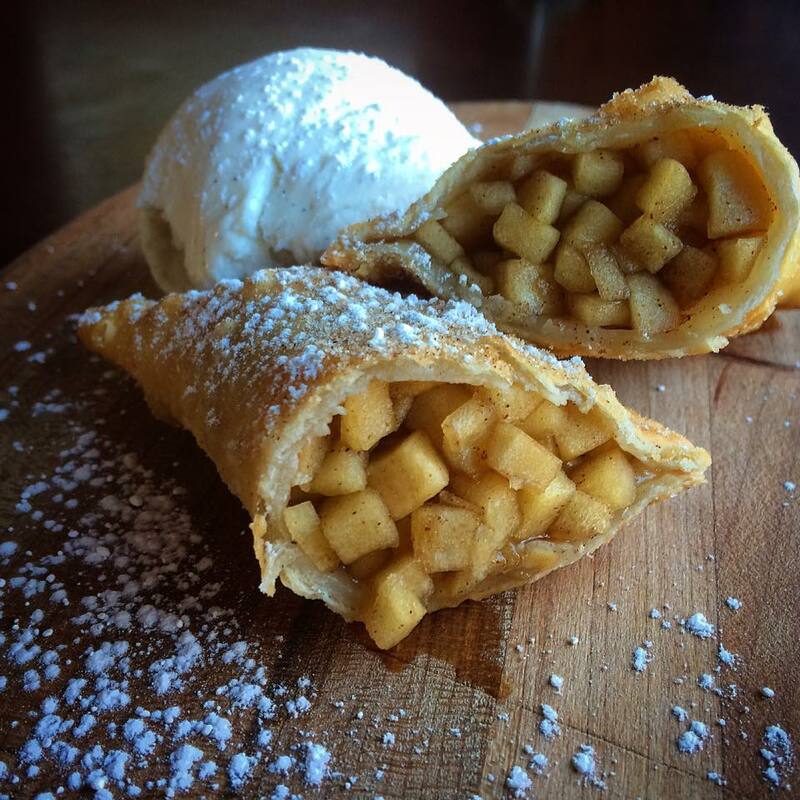 For the “apple,” we enjoyed an awesome caramel apple empanada with vanilla ice cream at Taproom On 19th (after our burger), which we think the Beastie Boys would have definitely enjoyed. 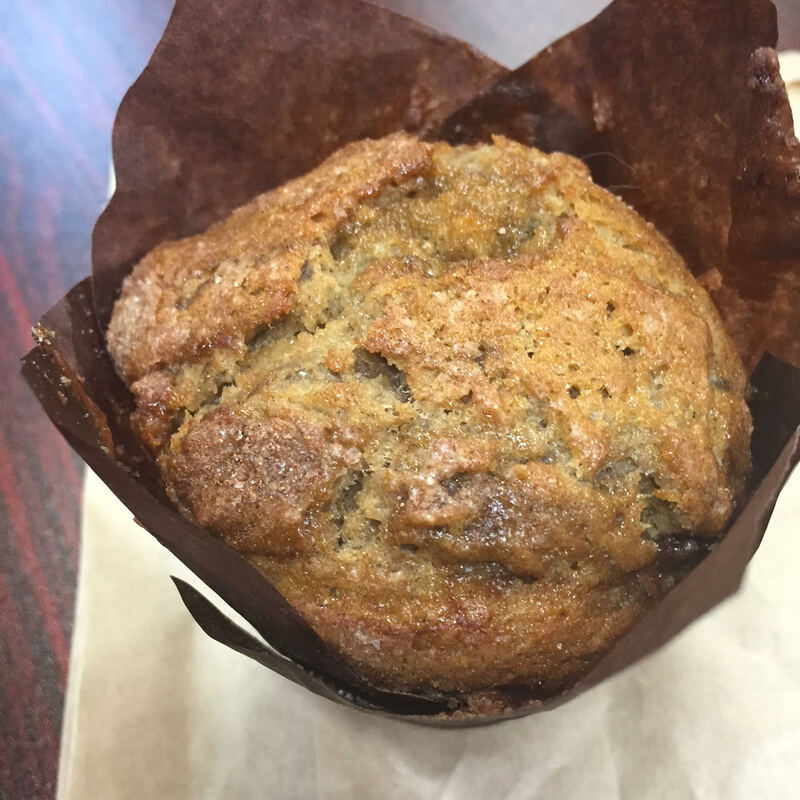 And for the “plum,” we enjoyed a Brown Sugar Red Plum muffin from Metropolitan Bakery. 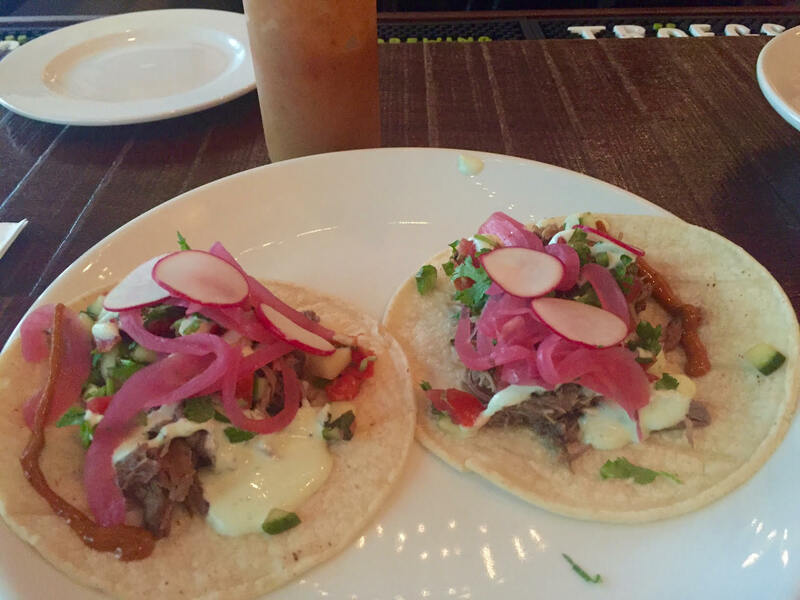 Once again, we visited Jose Pistola’s in Center City to focus on a cucumber in hot sauce. Luckily for us, cucumbers are part of their new lamb shoulder tacos — with a cucumber and mint salsa — and their homemade hot sauce definitely brought the heat. 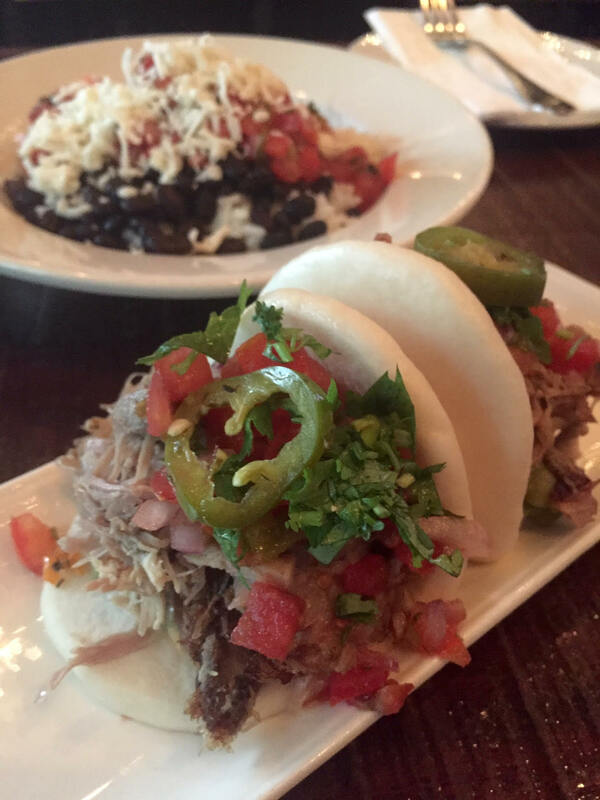 For “pork & beans” (& rice), we did some carnitas steamed buns and rice & beans (and hot sauce!) at Jose’s. So good! 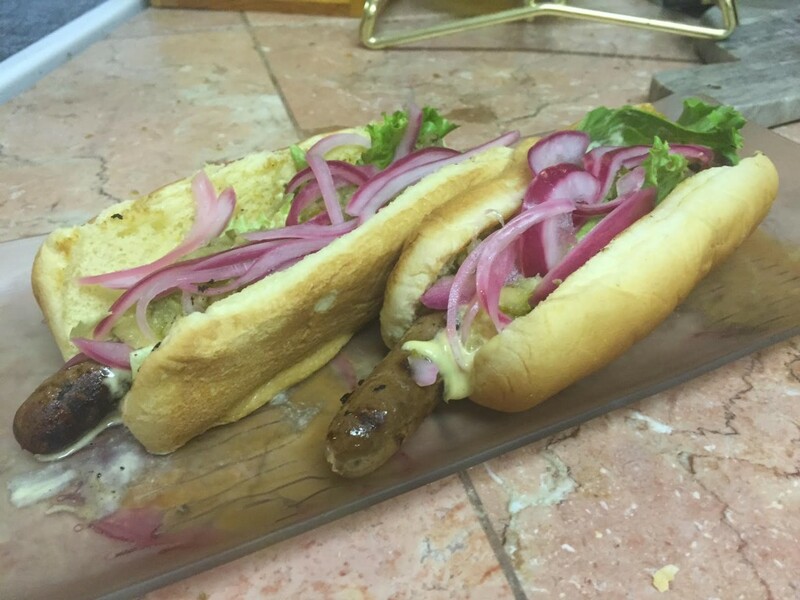 To make the “franks” official, though, we got some hot dogs to go at Misconduct Tavern — house made hot dogs with pickle relish and mustard sauce. 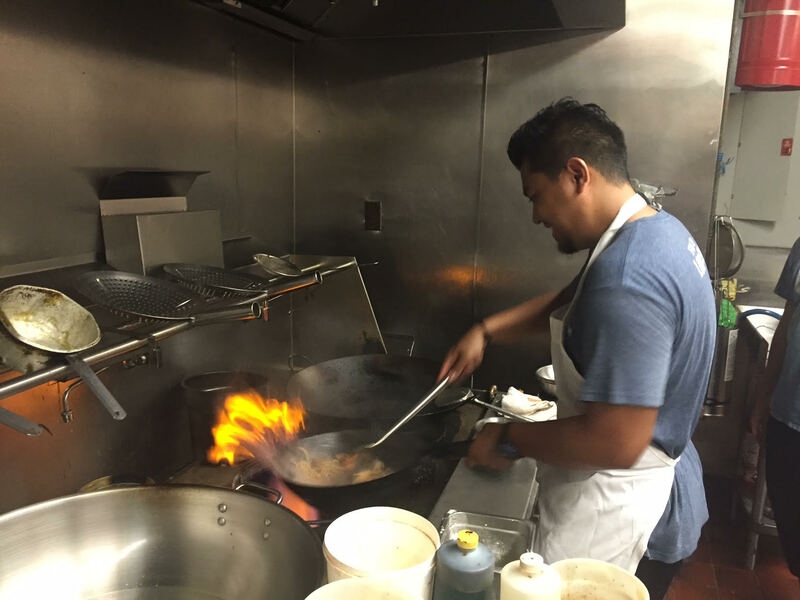 We went behind the scenes at BarLy in Chinatown this year, where chef San Heng showed off his “wok skills” for us, while stir-frying up some delicious beef lo mein. 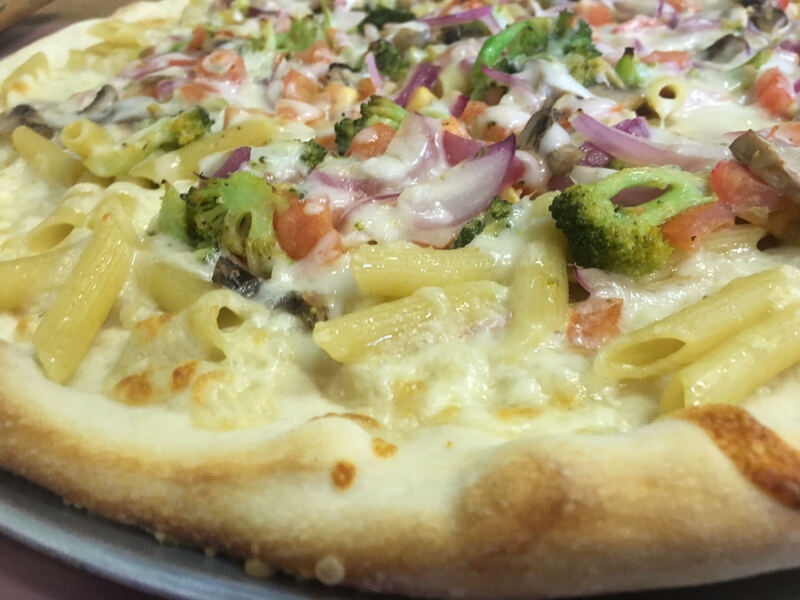 We crossed the Delaware River and visited Pizza Amore (Delran, NJ) for a special version of pasta primavera this year … pasta primavera pizza. Owner Jamie McCracken rocks! 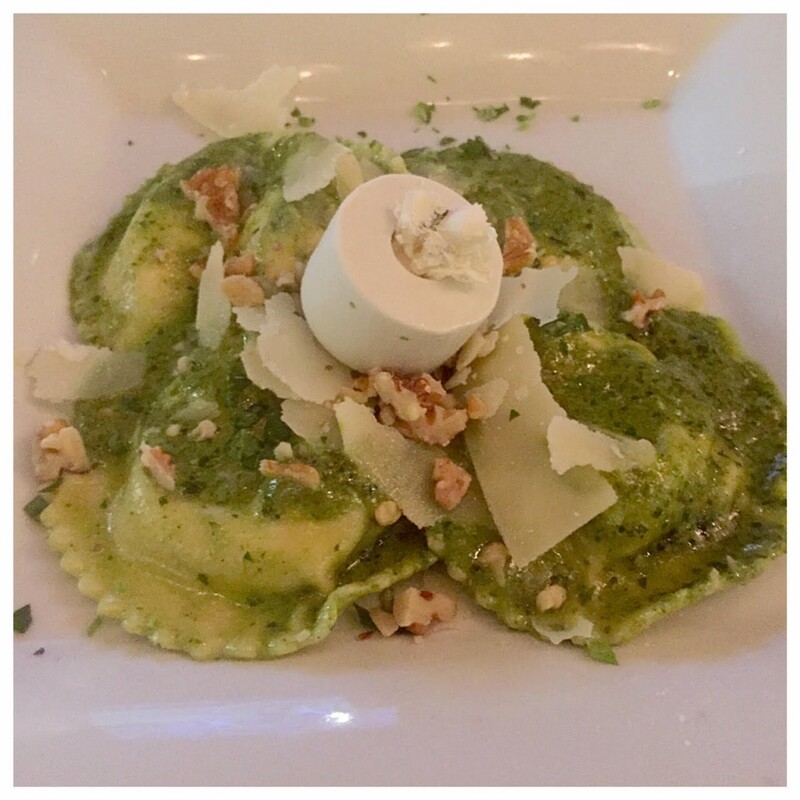 As mentioned above (see our “cherry” & “peach” course), we dined at Gran Caffe L’Aquila, where we enjoyed the special pasta dish of the week — Pansotti alla Gorgonzola, hand-rolled ravioli filled with fresh herbs and Ricotta, topped with a delicate walnut-Parmigiano pesto and gastronomic Gorgonzola cheese & fig gelato, by gelato champion Stefano Biasini. The best gelato in the world! Once again, we desperately tried to find pannenkoeken (Dutch pancakes) in Philly. 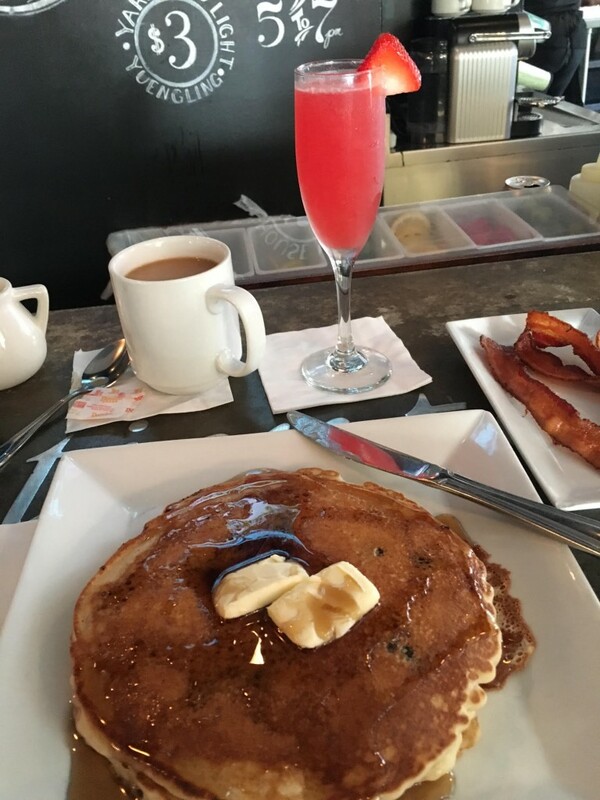 While we still have yet to find them, we went to Marathon (19th & Spruce) to eat some (a lot of) pancakes. And there you have it, many (many!) bites/sips later, we’ve completed our third annual Beastie Boys-inspired food/drink tour in honor of Adam “MCA” Yauch. We look forward to doing this again next year and every year on the weekend/week before August 5th. Did we miss anything else (that’s not in this year or the last couple years‘ food/drink tours)? 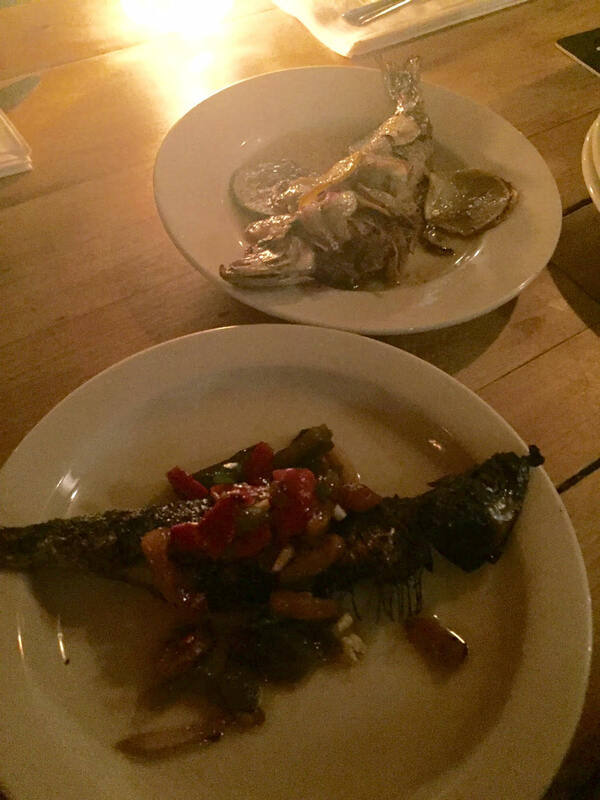 Do you know where to find pannenkoeken in Philly? Let us know in the comments section below. Cheers!